Last weekend I took an overnight trip to the Oregon Coast. One of my very favorite places to visit when I am there is Yaquina Head. This "Outstanding Natural Area" boasts gorgeous views, pebble beaches, hiking paths, tidepools, and most important, a historic lighthouse. 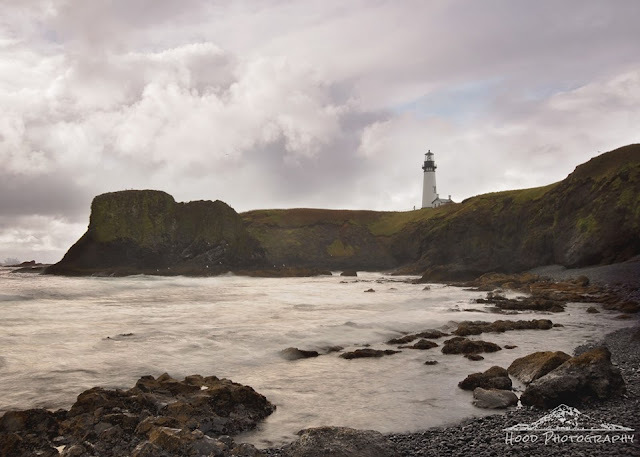 Standing down on Cobble Beach, overlooking the ocean waves rushing over the tide pools, you can see Yaquina Head Lighthouse standing proud against the cloudy Oregon coast sky. Beautiful shot, and a commanding view! I'm always appreciative of a good lighthouse. Beautiful rocky setting for this delightful lighthouse.